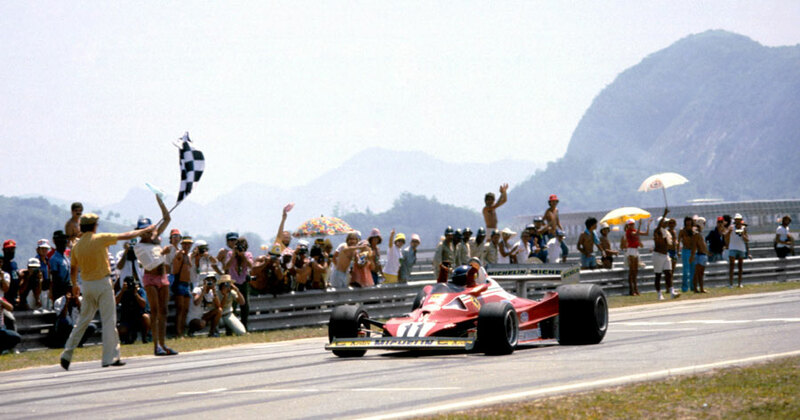 Carlos Reutemann won the Brazilian Grand Prix for the third time in his career as his Ferrari claimed honours at the Jacarepaguá circuit. It was the first win for the new Michelin tyres, ending a run of 80 successive race victories for Goodyear. That Arrows made its debut in Brazil was remarkable given the team only moved into an empty warehouse in Milton Keynes two months beforehand and in effect built a new car in that time. Gunnar Nilsson was due to drive it but he was absent after having a cyst removed; in the event, he was diagnosed with cancer and never got a chance to show what he could have done. He died in October. From fourth on the grid, Reutemann made a superb start to lead the pack on the way to the first corner with Ronnie Peterson (Lotus), James Hunt (McLaren) and Mario Andretti's Lotus slotting in behind. Reutemann was in a class of his own as he pulled clear from the pack helped by a slow Peterson in second place who was struggling with bad understeer and had to reduce his pace to prevent his tyres from being destroyed. That allowed Hunt to jump him but he abused his tyres too much and pitted after the sixth lap, before eventually crashing on lap 26 after failing to take a bend. His explanation - "I just lost interest and so spun off" was a worrying indicator of his deteriorating interest in the sport. It completed a bad weekend for Hunt as he had earlier been fined $500 for driving around the circuit without a helmet after a spin in qualifying. Up to second came Andretti with Peterson dropping back into the clutches of Gilles Villeneuve's Ferrari, a battle which came to a head when Villeneuve attacked and Peterson refused to give way. The two touched and went off allowing Emerson Fittipaldi's eponymous creation up to third. The Brazilian's day got even better when Andretti's Lotus got jammed in fourth gear, allowing him to secure second, while Niki Lauda took his second podium for his new Brabham team. The 60,000 crowd, who had been kept cool by having fire hoses turned on them, went delirious - not for the winner but for local hero Fittipaldi.